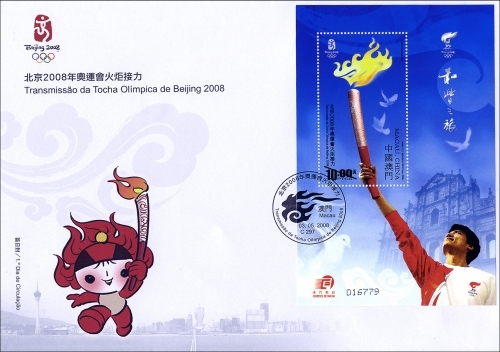 The Beijing 2008 Olympic flame will travel to Macao on 3rd May. In this final stop outside the mainland territory, the general public of Macao shall have an early taste of the Beijing Olympics through the ignition of the sacred flame in the city featuring “East meets West”. 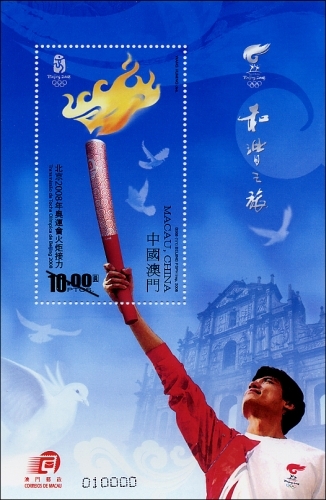 Macao Post will issue the stamp issue “Beijing 2008 Olympic Torch Relay” on 3rd May, 2008 in commemorating the longest relay route, with the widest geographical coverage and the largest participants in the history of the Olympic Games. 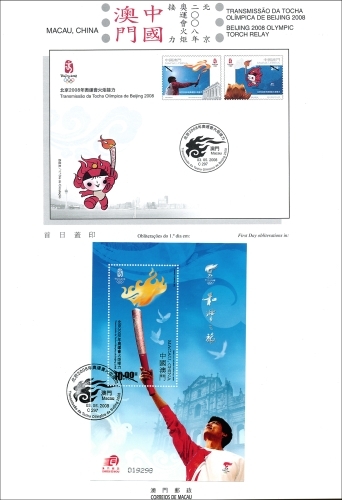 The stamp designer for this issue is Mr. Wang Huming, and the text for the information brochure is written by the Macau Olympic Committee. This is the third issue in 2008. 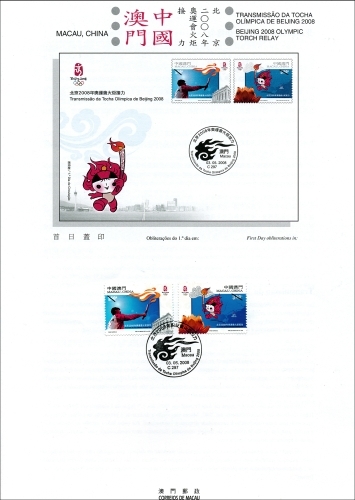 The issued stamps are as “Lunar Year of the Rat” on 23/01/2008 and “I Ching, Pa Kua VI” on 01/03/2008. 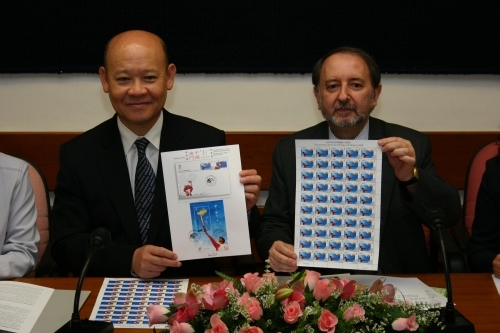 To celebrate the International Museum Day, Macao–2008, Macao Post announced that a Temporary Post Counter will be set up at Taipa Houses – Museum at 14H00 to 18H00 on 4th May 2008 providing the commemorative postmark cancellation service for the “International Museum Day, Macao–2008”. 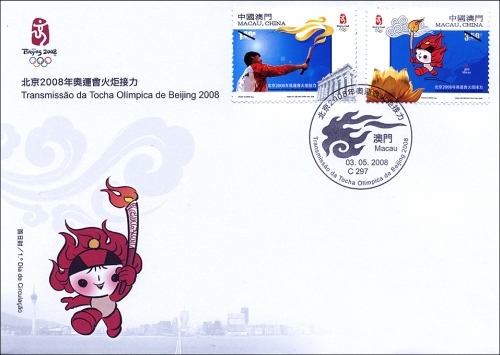 To commemorate the Beijing 2008 Olympic Torch Relay - Macao, Macao Post announced that a Temporary Post Counter will be set up at our philately shop at the Macao Post Headquarters at 9H00 to 17H30 on 3rd May 2008 providing the commemorative postmark cancellation service for the “Beijing 2008 Olympic Torch Relay - Macao”. 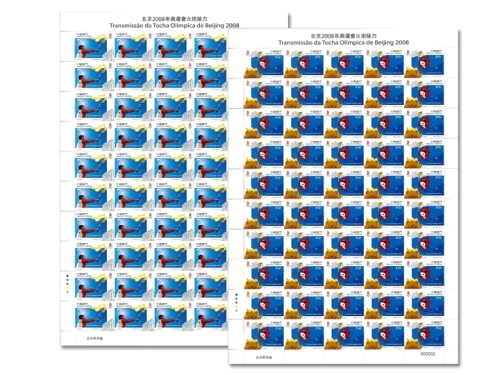 Two envelopes with different design will be issued. 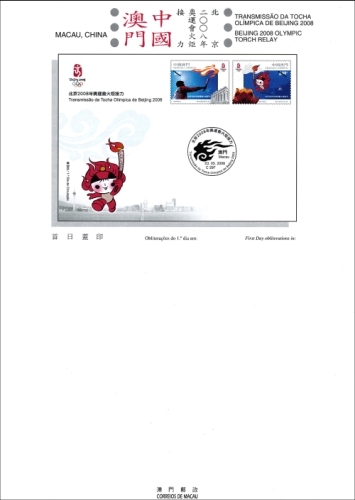 A commemorative envelope issued by Macao Post will be priced at MOP3.00, and a commemorative envelope issued by China National Philatelic Corporation will be distributed to public. Together with the various philatelic products available for sale during the above activity.